Homes.com, the online real estate resource and leading provider of enterprise-level solutions for real estate professionals and brokerages, has released six-month results for its first six fully integrated MLS partners. Those partners are MetroList Services, Inc., California Regional Multiple Listing Service (CRMLS), Intermountain MLS, Bay Area Real Estate Information Services, Inc., MLS Listings, Inc., and Houston Association of Realtors. ● All leads from listings are sent back to the listing agent. ● Exclusive branding and clear attribution for the listing brokerage and agent on listing detail pages. ● No competing advertising from other real estate professionals on listing detail pages. ● Partners can choose to display the MLS Trusted badge, promoting the accuracy and timeliness of the property data. ● More timely and accurate listing data. Data feeds are updated at least four times daily. ● Lead conversion tools including: Lead & Contact Manager, Email Campaigns, Task Manager and Calendar, Homes.com MyHomes Profile with Question & Answer Access, the Homes.com Facebook Listing App, and more. 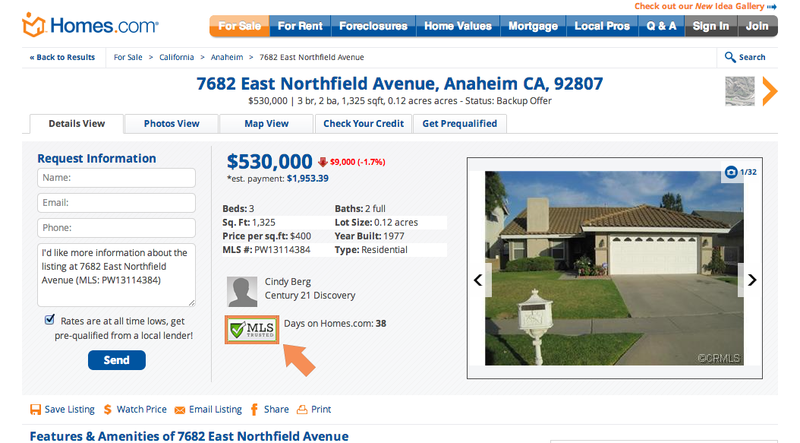 Resources: View a screenshot of a CRMLS listing with MLSTrusted branding here. To download the MLSTrusted logo, click here. REALTrends 2013 Online Performance Study is available here. Homes.com is a leading provider of real estate marketing and media services, including brand advertising, property listing exposure and syndication, search engine marketing and instant response lead generation. Homes Connect by Homes.com offers the real estate industry’s first-ever all-inclusive marketing platform for agents and brokers featuring single-login convenience. Over 12.5 million consumers visit Homes.com each month to search nearly 3 million properties for sale or rent, to locate real estate agents in their area and to find useful home buying tips. For more information, visit http://www.Homes.com.